Before we get to the final temperatures, we look at the warm-up phase, which only lasts a few minutes for all of these CPU coolers. The ambient room temperature was held at the same steady 22 degrees Celsius during all tests, which makes the results comparable. AMD's Wraith and Thermalright's Macho Rev.B achieve almost identical temperatures when the BIOS fan control is left at its default 50 degree Celsius target. The smaller Wraith gets warm more quickly than the significantly larger Macho, of course. 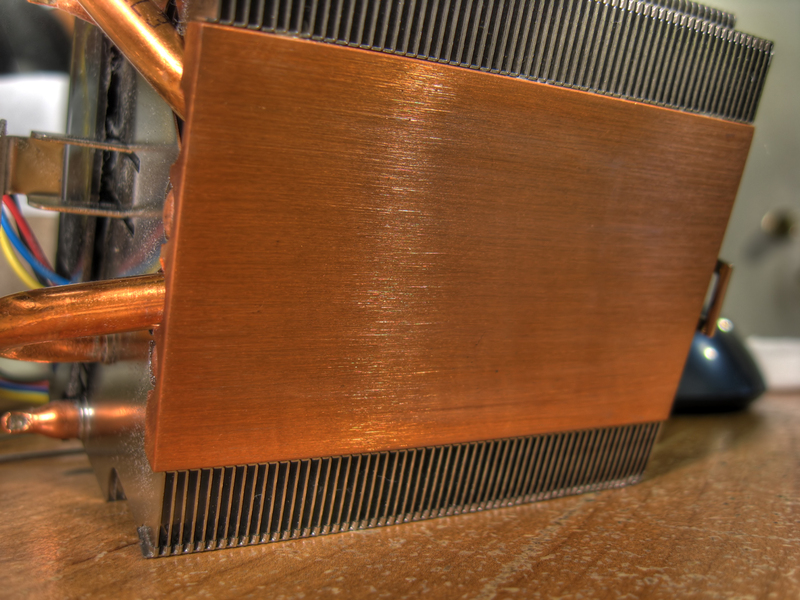 AMD's old stock cooler is a good example of cutting corners. The board has trouble keeping things steady, since there's just not enough cooling performance to stabilize on a setting. Consequently, it has to really push the fan all the way to its maximum to get things back under control when the processor reaches its maximum temperature. The 64 degrees Celsius result that we measured on the heat spreader is just too much. In order to gain a better understanding of what exactly is going on here, we're comparing infrared measurements of all three CPU coolers. We're starting with the old stock cooler. For the following results, all desired measurement locations were coated with a calibrated lacquer to guarantee accurate readings. A whopping 62 degrees C measured at the heat pipes is simply too high; the small CPU cooler just can't deal with this amount of thermal energy. Approximately 2 degrees C difference between the heat pipe and heat spreader is a testament to the poor quality of AMD's old stock cooler. The 93 degrees C measured right next to the voltage converters isn't great, but it's acceptable. The Wraith's results tell a different story. It stays significantly cooler, and the heat pipes and spreader achieve close to the same temperature. The outer cooling fins stay cooler, which is the result of the Wraith's larger size and better thermal performance. The top-down airflow design also helps cool voltage regulation-related components on the motherboard that aren't actively cooled. They reach a maximum of just 91 degrees Celsius. Last and certainly not least is Thermalright's Macho Rev.B, which keeps the processor at about the same temperature as AMD's Wraith, but at a significantly lower rotational speed with its 140mm fan. For this reason, its fins stay a bit warmer, but Thermalright's CPU cooler's sheer size easily compensates. What's not as great are the component temperatures in the VR area of the motherboard. They are a massive 14 degrees C higher compared to the Wraith. Since some of the components in question are capacitors, these kinds of temperatures aren't acceptable over longer time periods. This is generally a problem with tower coolers. Asymmetric designs, which are supposed to make the coolers compatible with taller RAM sticks, further exacerbate the issue. From this perspective, the Wraith actually cools better, since it cools the surrounding area on the motherboard in addition to the processor. In a closed case, this problem gets even worse, since the RAM sticks cut off any airflow below a certain point. Let's close this section with an overview of the temperatures of the different measurement areas after one hour of continuous operation. Do note, however, that these temperatures barely changed after the warm-up phase. The Wraith's temperatures are right on target—we know this much from our measurements so far. Even if the Wraith can compete in the temperature arena, the question remains if this comes at the price of high fan speeds, which can lead to high noise levels. Once again, it's easy to spot just how much the motherboard's fan controller has to work to keep the processor from frying with AMD's old stock CPU cooler. The Wraith's 1700 RPM results are decent, especially considering that its maximum is almost twice this speed at 3100 RPM. This means that it has enough reserves for some peace of mind and potentially provides a peaceful noise level as well. The Thermalright Macho Rev.B's fan plays in a whole other league with an almost inaudible 720 RPM. We're going beyond subjective impressions, though, by using our test chamber, which we constructed just for this purpose. This is where we're conducting all of our audio and noise (graphics cards, case, etc.) measurements. The total noise level is great for quick comparisons, but doesn't say a whole lot about the character of the noise. For this, the whole noise spectrum is needed, since it shows if there are peaks in particularly annoying frequency ranges. Once again, we get going with AMD's old stock CPU cooler. Up to 4300 RPM leaves a very much audible mark. Apart from some bearing and clicking sounds at approximately 280 Hz, this CPU cooler makes a whirring and hissing noise that's just unpleasant, which makes it even more annoying than the noise level would indicate. Not that the overall noise level is good—between 45 and 47 dB(A) depending on the current state of the fan controller is just a really bad result. AMD's Wraith doesn't just subjectively sound quieter, it actually is more quiet. Unfortunately, the ball bearing does make a rattling noise that can be both subjectively heard and objectively seen in the spectrum graph without much effort. The 38 dB(A) that we measured are a good result. Even under full load, the Wraith just doesn't get that loud. The ball bearing of the inexpensive fan is the only caveat here. Overall, this is a very solid result, especially since the cooler can't really be distinguished from the other noise sources in a closed PC case, as long as there are no passive components. Thermalright's Macho Rev.B plays in a different league. Its 32 dB(A) and very low-key frequency spectrum can attest to this. The results could have been even better, had it not been for the turbulence caused by the RAM sticks. On AMD motherboards, the Macho's body, which sits relatively close to the board, actually touches the RAM sticks, which consequently cuts off some of the airflow. Since Thermalright's Macho Rev.B isn't a high-end, but an upper-mid-level CPU cooler, the only possible conclusion to be drawn here is that AMD's marketing statements about the Wraith being the quietest CPU cooler in this price range are way too optimistic. AMD's Wraith is a well-designed, nicely built and generally solid CPU cooler. To be fair, this means that it is in a league of its own when it comes to stock CPU coolers. In this context, we'll forgive the overly optimistic statements by AMD's marketing. In the end, the message does have a point: the company's Wraith might be louder than Thermalright's Macho Rev.B, but it also does a better job cooling the motherboard area around the processor. So, AMD's Wraith isn't as quiet, but it does provide more cooling in certain areas. This is actually a great bottom line to write about a stock CPU cooler. After this move by AMD, things will never be quite the same in this arena, especially if the Wraith should gain traction in the market as a free add-on. The metal waste bins of many PC shops and builders could be looking forward to a lot more empty space, at least as long as the people in question are using AMD processors. And maybe, just maybe, this would force Intel's hand, and then the aftermarket CPU cooler industry would have a real problem. Only time will tell. AMD's Wraith doesn't make the FX-8370 any faster, but because the price stays the same with the new CPU cooler included, it makes it more attractive. We'd say that it fits in the $20 to $30 category, which represents some nice savings for anyone who's buying a new processor and doesn't already own a suitable CPU cooler. good work. however, if they expect to sell more processors because of this, they will surely be disappointed. good job noting the importance of top down coolers over tower coolers. I think the methodology and the data shown in this review makes it a great cooling review - I hope it sets a trend! I wonder how Crashman's old Thermalright MUX-120 might measure up? Maybe people will buy the AMD CPU to cool their Intels. AMD should include an Intel adapter just in case. This review does bring some considerations towards cooling the motherboard. First it demonstrates how MSI gets its better performance, by allowing higher voltages and using higher quality capacitors. This is one of the reasons I love MSI, and one reason some MSI GPUs have burned. Second the big CPU coolers and liquid coolers don't adequately provide cooling to cheaper motherboard components. Higher end motherboards might be a different story with their large heat sinks. Seems like this directly butts up against the Cryorig C7, which by my research does everything better. Also, if you have an Intel chip and are feeling left out by this new cooler, the C7 can massage your...worries. "From this perspective, the Wraith actually cools better, since it cools the surrounding area on the motherboard in addition to the processor. In a closed case, this problem gets even worse, since the RAM sticks cut off any airflow below a certain point." I like it, hopefully all Zen CPUs of 95W+ get this cooler. This is actually not true if your case exhibit at least some airflow. The memory modules blocks each airflow with the Macho, independend from the airflow in your case. That alone probably won't boost sales, but it is always a welcome bonus. I won't find ways to criticize AMD on this. <40db is just dandy. I've never had an issue with levels like that. And with good cooling its an excellent result. It's hard not to beat their previous design, it was widely criticized for being massively incompetent. That being said, it's nice to see a better pack in cooler at the same price. good work. however, if they expect to sell more processors because of this, they will surely be disappointed. good job noting the importance of top down coolers over tower coolers. A large part of AMD cpu's value lay in overclocking. 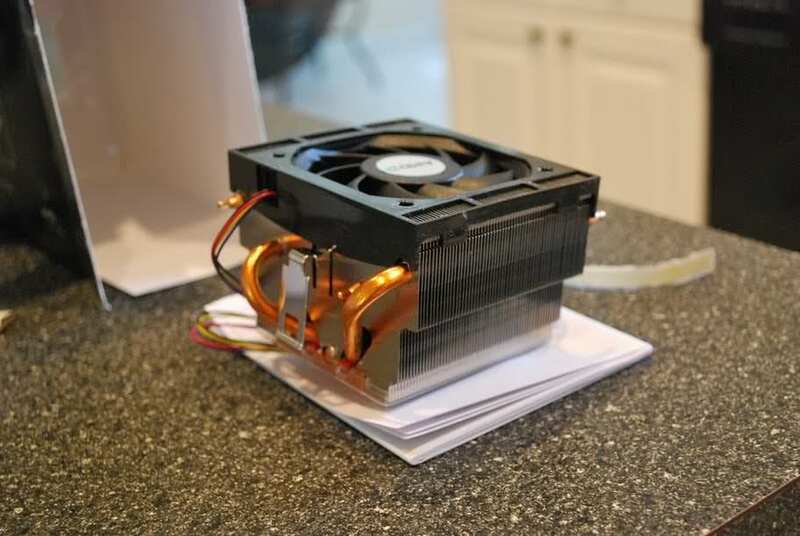 You had to buy an aftermarket cooler before the wraith, which destoyed most of the value versus an intel CPU at stock speeds on intel's stock cooler. The wraith seems to have some headroom to overclock. I'd love to see an article on how far Tom's can push the 8370 on the wraith cooler. Awesome review with some great IR pictures and analysis. I hope those will be the standard in future cooling reviews. AMD should sell this cooler by itself. And make it compatible for Intel boards. This looks like a really good SFF cooler. Does anyone else feel they should have included the Hyper 212 Evo or the Cryorig H7? Since they cost only $25-35, they should be people's aftermarket coolers of choice. I don't think this Thermalright cooler is more popular than those. The goal of a boxed cooler is the compatibility to all RAM modules and mainboard settings, AMDs own mounting system included. It is important to minimize the assembly time (SI and OEM business) and the mounting must be secure in each case (weight of cooler, mounting, shipment). AMD did a very good job on this. I had a 860K and the fan would constantly spin up and down, even at stock MHz with turbo on. I don't think they get enough credit for the things they do right. Intel could learn from this. It looks just like the socket 939 stock AMD opteron coolers, but with a larger fan. It is a decent image, but they need to get matte black spray paint to coat 1 side of the cooler, ad they do not work with reflective surfaces.